Selling products as an affiliate is a popular way for people (that are new to Internet marketing) to get started with understanding how to money online. You don’t need to create your own product or stock any inventory, and in some cases – you can even make money without even having your own website or hosting. Unfortunately, there are a lot of products for sale telling newbie’s how easy it is to make money online, but despite all of the claims, most people will fail. 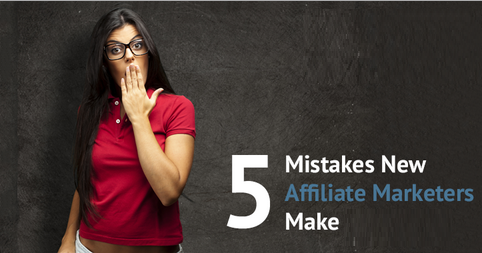 To help keep you on the right path and increase your chances of success, we wanted to point out the 5 biggest mistakes new affiliates make and how you can prevent them. The fact of the matter is that some competition is a good sign. If there are a lot of people promoting products in a particular niche, there is a good chance that people are making money in that niche. If you are promoting products by using search engine optimization to get traffic to a website, you will want to look for low competition keywords but not low competition niches. Niches like weight loss, skin care, and relationships are huge, evergreen niches that will never go out of style. In fact, there is more than enough money in these niches to go around. A lot of affiliates will purchase an e-book or some video course that tells them how to find and promote products. Many new affiliates will go through their training material and never actually try any of it. Instead, they may read an e-book, think to themselves that the techniques are a good idea, and then they get excited about the next big product being promoted by the Internet gurus. To avoid making this mistake, pick a system and give it an honest try. If you purchase a course that teaches you how to use pay per click or banner advertising, be prepared to give it a little time and spend some money on it. If you are promoting products using free traffic methods like SEO, video marketing, or social networking, you need to put in the time and effort to give those traffic methods a chance. If you are getting traffic to your offers and the traffic is not converting, then you may want to promote a different product. But don’t quit before you give your chosen method a fair chance. Another way new affiliates get distracted is by attempting to promote too many different niches or products at the same time. Don’t start 10 different websites and try to promote them all at the same time. Focus your efforts on one niche and a handful of products and spend some time getting traffic to the offers you are promoting. If you are trying to make money online, but every time you turn on the computer you spend more time chatting in forums, updating your Facebook status, and watching YouTube videos (than you do on trying to promote your business), you will never be successful. You need to put some time and effort into your business each and every day. A lot of people are also afraid to spend money on their business. If you need to get traffic to an offer, you may have to spend some money on paid advertising. Even if you are focused primarily on free traffic methods, you may need to be prepared to spend some money on outsourcing certain tasks. Free traffic methods may not cost any money, but they do cost quite a bit of time. The problem is that if you are writing content for your website, creating videos for YouTube, building back links for SEO, participating in forums to get your signature link in front of your target market etc… All of these things take a tremendous amount of time. If you’re prepared to spend some money on outsourcing, you can pass some of these tasks off to someone else, freeing up more time for you to do the things that you are good at and/or enjoy doing. Let somebody else do the things that you do not want to do. Many affiliates put content on their website that is nothing more than a big sales pitch. Even if a visitor to your website is interested in the sales pitch, they click your affiliate link only to be presented with yet another sales pitch. This can be frustrating and irritating for a potential customer because they are pretty much reading the same information twice. On top of that, they will feel that they are under a lot of pressure to buy and that all you want is their money. Let the official sales page sell the product, while your website should pre-sell the product. You can give a description of the product, mention some of the benefits, and maybe even review the product pointing out both the pros and the cons objectively. Then, send your visitors to the sales page (that was more than likely written by a professional) and tested for maximum conversions. This is a huge mistake that many new affiliates make. People may not build an e-mail list because they don’t want to pay a monthly fee for an autoresponder, or because they don’t know how to build and properly nurture an e-mail list. The problem is that if you are not building an e-mail list, you are leaving a lot of money on the table. It is a lot easier to sell something to previous customers, or people that have shown an interest in the products you’re promoting, than it is to acquire new customers. Building an e-mail list allows you to market to the same people over and over again, giving you many opportunities to make a sale. An e-mail list is one of the most valuable assets that Internet marketers have. Start building an e-mail list and you will provide yourself with an ongoing source of long-term income. If you are not enough aware about how to take off an email list and bring in more subscribers to your mailing list, then I would recommend you to check out this post on how to build your email list.